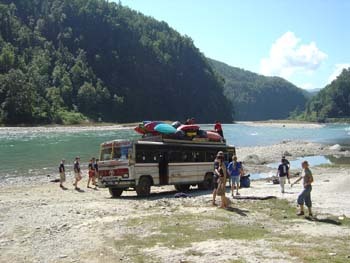 Private bus transfer to the Trisuli river. Kayak the Trisuli (grade III/III+) and overnight in safari style camp at Brigands Bend. A good safe introduction to big water and Himalayan rivers. 'Upset' rapid will have some people testing their rolling technique! Complete the Trisuli, finishing the day on the 'Pin Ball' rapid. Transfer back to and overnight in Kathmandu. Kayak the Upper Sun Kosi and overnight at the Last Resort, and a chance to enjoy a sauna to help ease those aches and pains. After a leisurely breakfast we take you back to the airport for your return flight to Kathmandu. Price includes: Transfers to/from Kathmandu Airport, all accommodation, all meals (except where specified in itinerary), all equipment, guides. Excludes: personal insurance, personal drinks (soft drinks, beer etc. ), tips, international flight.